Today I finished setting up my classroom! I'd say it was a success! It's not quite perfect, but all the major stuff is ready in case the teacher work days are full of meetings and lacking in prep time. I did a pretty good job of hiding out in my room and not talking to people so I'd have time to finish it all today. With the exception of course, of my adorable teacher friend who is in her second year teaching. I've been helping her with ideas and sharing classrooom setup materials with her. I was soo excited about finishing my classroom that I called her over to check it out. Here are the before and after pics if you'd like to check them out. Notice that the one horseshoe table takes up almost the whole main area of the room, and endless pipes run along the walls and ceiling. The odd arrangement is the best I can do with the space. It was meant to be the living room of a house a hundred years ago, not a classroom. I'm pretty excited that I've been able to make it look pretty much like a normal classroom. To make things even better, I was able to finish before lunch and go to the San Francisco Zoo with my friend! I saw lions and tigers and bears, OH MY!! Living in the Bay Area has it's advantages! View from my kitchen, yes, I have one in my classroom! View from the whiteboard facing the front door (new curriculum!) I forgot to take an "after" for this one! Oops! LOVE the chair pockets I made!! I made a "Star Work!" bulletin board to display kids' work. I put their names on stars next to a small binder clip for easy swapping when I put up new work. The colored chart is our school behavior system. I should take a close up of that area and post it next week so you can see the "Star Rewards" section underneath. The kids can earn reward coupons and store them on the wall until they are ready to redeem them. The empty pocket chart will be for centers activities (sorting, spelling, etc.). My schedule is to the left of the whiteboard with little clocks next to each activity. The calendar section is on the bulletin board to the left. It's a disgrace by most kindergarten standards, but I can't put it any lower. Besides, I teach 3 grade levels, calendar time is hard to do in a way that benefits all of my kids. Instead I teach calendar-time concepts during other times of day like centers and morning meeting. This is my newly created centers area. The kids can stand on either side of the table to participate in hands-on learning activities. I sewed the fabric last night to hide the materials and curriculum hiding under the tables. I placed the anchor charts where the kids can easily refer to them during centers time. This way they can problem solve while I am working with another group at the horseshoe table. 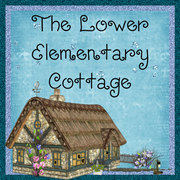 The Lower El Cottage: I have a tower! How cool is that?! Very cute! I'm SO jealous that you have a kitchen in your classroom! I like the fabric under the tables to hide materials! You came a long way from the before! I'm off to check out the rest of your blog. Do you teach resource? I'm assuming you do pull-out? I love seeing how other special ed teachers do things. I actually teach in self-contained room. Our whole school is special ed K-12, so no pull out for us! I have K-2 all day with a max of about 6 kids in my room, 8 kids in the older rooms. I teach 3 grade levels at once, so I have a system of each kid working at their level and I go between them teaching them the skills they need as they work. I instruct them in pairs or tiny groups for new concepts, while other kids do seat work, reading or centers activities. Neat classroom! I just read in your comments that you teach in a special education school??? I would love to hear more about that and how it works. Love your school! 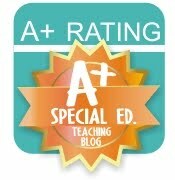 I also teach in a school that is all special ed, k - 12 for students with emotional and behavior disorders. This year I'm teaching 4th and 5th grade, some years I have anywhere from one to three grade levels in one class, just depends on our numbers. We have 6 teachers in the building. I'm your newest follower, found you through Mrs. H's resource room blog. It looks great- thanks for linking up. i see you went to the SF zoo. I'm an hour up north from there. I love your tower! So cute. And you did a great job setting up your class! Thanks for linking up:) Good luck with the new year!